January’s MiniMoFo theme is Creating Warmth. Good timing for me because one of my new obsessions involves doing just that. It all starts with a flashback. Christmas morning and we were opening gifts. Kate had ordered my presents from Amazon, complete with gift wrap. One was book shaped and the other was big and rattled and I was convinced it was one of the board games on my wish list. It wasn’t. Instead I got three of these jars with Sterikap lids. Perfect for fermenting. I was instantly filled with warm fuzzies. You see Kate hates ferments, she hates the smell of ferments, but here she was, buying me these jars so I could do it in style. With less of a smell. I think that was one of her main considerations. Immediately I started wondering what I could ferment. And then it hit me. If Kate wasn’t going to eat what I was fermenting anyway why not use something I know she hates: chillies. A copy of Fiery Ferments by Kirsten K. Shockey and Christopher Shockey was soon making its way towards me. It’s a fabulous book. It’s friendly and approachable but still detailed and technical enough to give you good results. I really enjoyed the section ‘Hot and Spicy B.C. (Before Chillies)’ and the pre-chilli recipes. The discussion of all the different techniques humans have used to add heat to their food is both fascinating and mouthwatering. We’ll get back to that later. The first ferment I tried was the Basic Pico de Gallo Starter. The idea here is that you ferment everything but the tomatoes. That way you have the base ready to go and only need to chop a few tomatoes to mix in when you need your salsa fix. Usually when I make Pico de Gallo it either goes off before I can eat it all myself or I end up with lots of odd half bunches of coriander and diced onions left in the fridge. Apart from a few tomatoes, everything is preserved in the ferment. So I can make my little single portion of salsa whenever I want. I also made the green peppercorn mustard. I love mustard, especially the grainy kind and I was intrigued by the addition of green peppercorns. They really make it sing. It has a clear, fresh taste and a gentle heat that sits on the tongue. I think there will be sausages in my future, served on a baguette and draped with more mustard than is probably advisable. As you can probably tell I’m having a lot of fun with my new jars and book. I have a dozen more recipes dog eared to try. Just need to find more chillies. I’ve followed Fat Gay Vegan for… well much longer than I’ve been vegan. I’ve always admired his commitment to creating an open, inclusive vegan community. One where everyone is welcome. As at tubby, bi, working class girl I can occasionally feel shut out, and I know others have it worse. I was excited to receive a copy of the book Fat Gay Vegan in January’s Vegan Kind box, and after two days of reading I can tell you I wasn’t disappointed. Just a reminder: I only turned vegan myself back in May, so to me the first couple of chapters, ‘Why Vegan?’ and ‘Vegan 101’ were super useful. Not because I don’t know what a vegan is, or why I am one but because it’s always nice to hear these things from someone who is a bit better at the articulate thing then I am. The book starts to delve deeper in the chapter ‘Vegan Means Vegan’. And I think any vegan, new or old, is going to love this bit. And learn from it. Life skills like how to politely, but firmly decline things that aren’t vegan (and why it’s not social suicide) lead us into the next chapter: ‘Ethical Vegan’. This chapter stops you in your tracks, and points out areas you could be doing better. It asks if your veganism is respectful of humans as well as non-human animals. It’s a blueprint for an intersectional veganism that respects all life. But it’s not preaching, it’s not insulting, instead it gently invites you to do better. Encourages you to do better. And if you are wondering how the next chapter on ‘The Importance of Community’ might give you a few tips. After that the book touches on travelling as a vegan and lays out a hopeful vision of the compassionate future we could create. And overall this book is hopeful, it’s positive. Yes, it’s about the necessary changes we need to make both in the world and the wider vegan community but I’m left feeling like we can make those changes. We can create a world where no animals suffer to feed us, and people aren’t exploited bringing crops to harvest. We can create a vegan community that welcomes all people, that doesn’t use othering to sell its point to a wider audience, that doesn’t exploit others trauma for cheap comparisons. Fat Gay Vegan isn’t a step-by-step guide as to how we’ll manage all that but it gives you a good starting point. I was so excited about the release of this book that I pre-ordered it. Unfortunately, as I’m in the UK it arrived right in the middle of Vegan Mofo and just before I went up to Manchester to visit my family. Not great timing, I couldn’t give it the attention it deserved. Thankfully I’ve had time to play with it a little since then and it’s amazing. But before I tell you just how amazing you might want to go and order yourself a copy. You can read the rest of my review while they are delivering it. Vegan Richa’s Everyday Kitchen is a wealth of simple everyday dishes. At the core are the Awesome Sauce recipes. You make one of these sauces and then you pair it with another recipe. For example lets take the Makhani Sauce. That’s the first one I made. You could make lentil balls to go in it, add protein or vegetables, or alter it slightly to make a Tikka Masala Sauce and make Tikka Masala Chickpeas. Which, as someone who grew up eating the English take on Indian food, is just pure comfort. It’s super easy to make too. With my leftover Makhani Sauce I decided to do something a little different. This time I made a delicious Makhani Vegetable Pizza from the Deep Dishing section (my current favourite) the creamy sauce combines with spiced tofu and crunchy vegetables to make a the fusion pizza of my dreams. The base also deserves a special mention, it only takes around twenty minutes to rise and it tastes great. Speaking of pizza we also couldn’t help trying the Alfredo Spinach Pizza. It starts with a white garlic sauce, followed with spinach fried in garlic and topped with more garlic sauce. Clearly you want to stay away from this one if you don’t like garlic but if you do it’s glorious. Then we made the Smoky Mac Bake. pasta baked in a smoky cheese sauce with a breadcrumb topping. Amazing. The addition of broccoli give you one of your five a day. Which brings me to another great thing about this cook book. It’s suggested that you can make it with cauliflower, mushroom or zucchini. There is a variation with a nut free sauce and the Smoky Cheese Sauce could go equally well ‘over roasted vegetables, baked sweet potato, dress burritos, nachos, toss into pasta and what not.’ There are almost endless variations on everything, and Richa guides you through your options allowing you too cook creatively and not just follow the recipe exactly. Like a good meal this review is going to end with something sweet. I made the One-Bowl Pumpkin Bread. Deep orange, lovely spices and chocolate chips. It… disappeared rather quickly and I have the ingredients ready to make another. If you didn’t go and buy it back when I wrote that first paragraph then all I can suggest is that you buy it now. Vegan Richa’s Everyday Kitchen is packed with flavourful, flexible and filling recipes and you are going to love it. And it only took three days before someone asked that question. Honestly though I never really bother making sure I get enough protein. I generally eat enough not to worry about it. But the world is a much better place when I have a protein packed breakfast. Start the day right and nobody has to deal with hangry me. 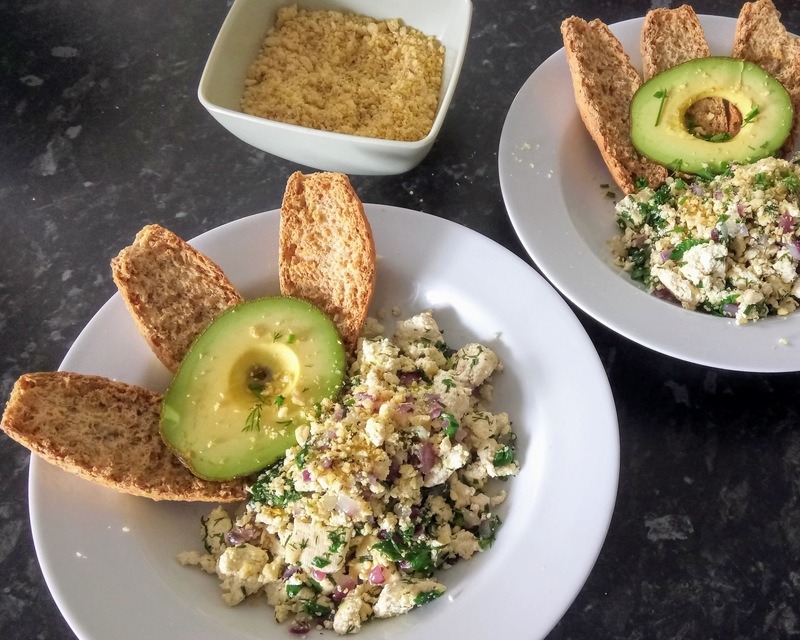 Time for tofu scramble. Usually I like a good spicy scramble – Taco Cleanse has my favourite – but I thought I’d try something a little different. You see a couple of days ago Kate impulse bought a cook book. It’s taken almost a decade but my bad habits a finally rubbing off on her. She picked up Bowls of Goodness by Nina Olsson in town this week after falling in love with the charming pictures and simple recipes. The book is vegetarian but offers advice on how to veganise dishes. The Stockholm Scramble is flavoured with dill and chives which really lifts things. Spinach and avocado gives you a couple of the ol’ five a day. A pine nut sprinkle over the top adds a delicious savoury umami note. We served ours with krisprolls rather than knäckerbröd but at least we kept it Swedish. I’m looking forward to trying more Bowls of Goodness soon. This resonated with me. As much as I like to go on complicated shopping trips to find unusual ingredients and as much as I like to cook everything from scratch I also don’t sometimes. Oh yeah. I know that McDonald’s Sweet Curry Dip is vegan and that Morrisons make the best packaged onion bajhis and six of them totally count as breakfast. The Full Kit. Book, salad seaweed, nori, liquid smoke, Achiote, Coconut Butter, Chipotle in Adobo, Nutritional Yeast and a Sous Chef Sack. Three days later I was still mulling over the cookbook that tells you how to crack open a coconut and contains pot noodle confessions. I was also out of Nutritional Yeast so instead of buying it on Amazon Kate went all out and bought me The V is For Vegan Kit from Sous Chef. She’s a good un. So here is a quick rundown of why you need this book. There is the usual section of what is vegan anyway and then we get to one of the best vegan ingredient primers ever. Interspersed between the paragraphs on why umami is all important and all the types of seaweed you can eat you’ll find recipes for homemade tofu, watermelon rind pickle, nut cheese and so much more. You could flip through it everyday for a week and still find new stuff to try. Ask me how I know. Then we get to snacks like 13 things on toast, Dried Pineapple Flowers and Roasted Chickpeas. Into the breakfast section and The Mexican Chocolate Shake with optional chipotle paste has become my new favorite light breakfast. Light on chewing that is. The Lunch Section has the Ramen Hacks. My fist experiment involved a packet of the cheapest noodles in the supermarket, some miso, all of the flavorings, spring onions, the last of our home grown spinach and slabs of smoked tofu. So satisfying to slurp. Since then I’ve bought even more cheap noodles. Dinner and Desert I’ve yet to cook from. I know, I’m a disappointment. They’re a bit too fancy, dinner partyish for the last couple of weeks in our life. It’s been kind of a ‘lets just have pasta’ couple of weeks. The dishes sound fab though and I have high hopes for the Carrot , Pepper and Lentil Tagine and Three Topping Polenta Party appearing on my table soon. And that’s why I recommend you buy V is for Vegan. There is food for when you are feeling lazy, food for when you are feeling fancy and a wealth of information to turn you into an empowered vegan cook. Any one of those things would earn a book two thumbs up from me but V is for Vegan has all three. So go buy it.